Resplendent with a soaring eagle graphic, a Van Hool Altano TD 921 from Shaw’s of Whitley’s fleet has recently had its bodywork reinvigorated. The work was carried out by Market Weighton based Britcom International and Acomb Signs from Acomb, near York. This is the second coach owned by the North Yorkshire based operator to have been given this new livery. 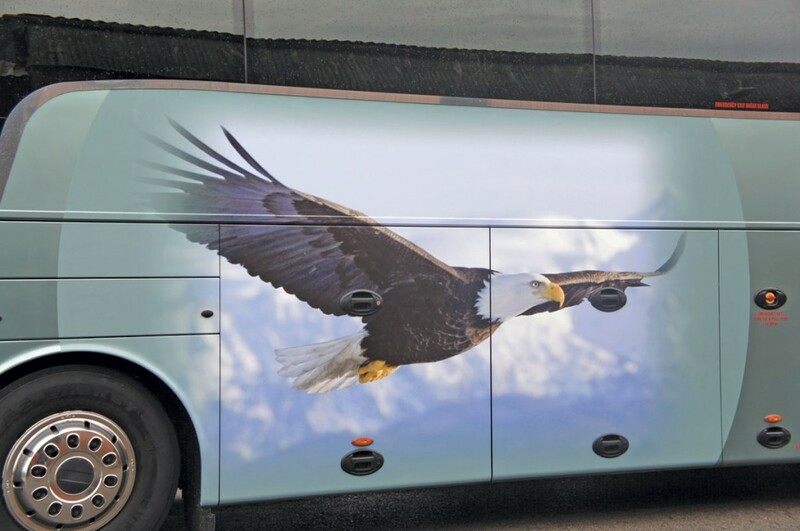 A close up of the eagle graphic. 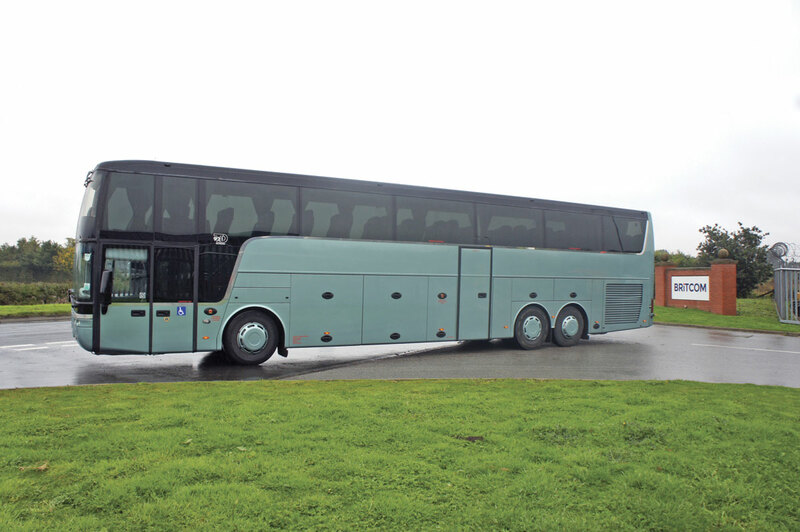 The 2008 plate Van Hool, which can carry 57 passengers or 55 and one wheelchair, was sent to Britcom’s Body & Paintshop for external refurbishment and repainting in a new colour. 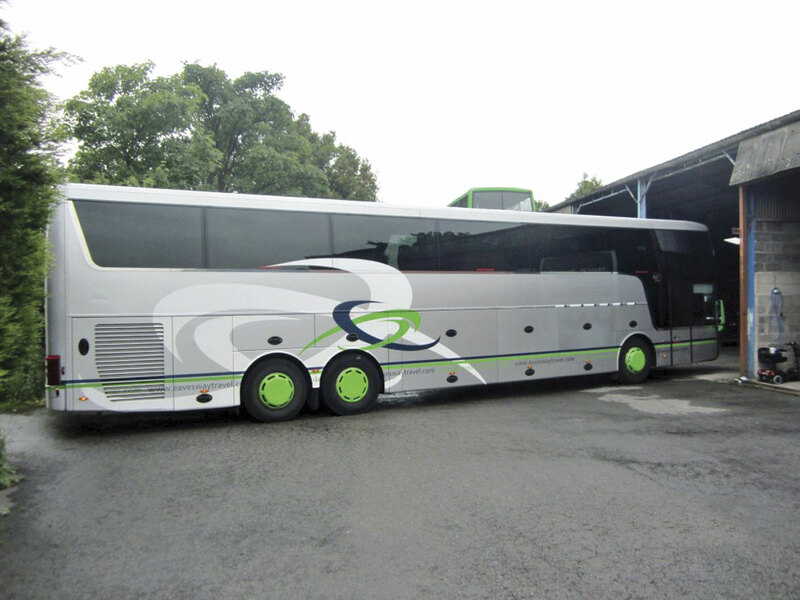 The company’s 26m spray booth took the 14.40m long and 3.75m high coach without any issue. The PPG Nexa basecoat metallic and two pack clear lacquer paint system was specially matched by PPG. The work was carried out to PPG’s FleetWatch standards. From start to finish the vehicle was with Britcom for two weeks. The company aims to deliver its work to high standards but with as little downtime as possible for its customers. Shaw’s Van Hool Altano TD 921 before going into Britcom. The Van Hool after Britcom repainted it. Once the refurbishment and repaint was complete, Acomb Signs, who Britcom work closely with, did all the decal and re-livery work. It was carried out by Mark Trousdale, a professional signwriter who provides vehicle graphics alongside promotional branding services. It involved taking an image of an eagle and putting in a fade on it that worked well with the metallic paintwork. This was then printed on vinyl using a wide format printer and applied to the vehicle. Mark can often be seen on Meridian Coachworks stand at the annual NEC show, where he has in the past been known to do some traditional signwriting. Shaw’s of Whitley is a family owned and run business which has been operating for over 40 years, offering corporate and private hire, tours and day excursions. It seems there is a pool of talented paintwork and livery specialists in Yorkshire, as the pictures here demonstrate. Acomb Signs can do various vehicle branding and signs, whilst Britcom can not only repaint but completely refurbish or repair a coach or bus.